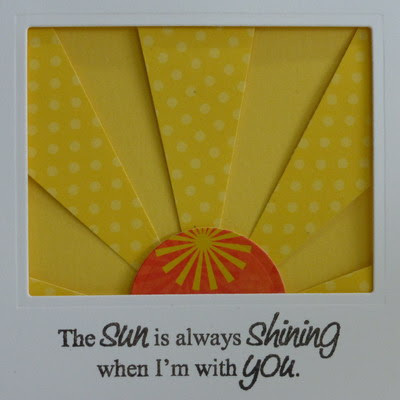 Stamping with Loll: Hello Sunshine! Hi everyone. I had such a fun day in the studio with Heather today!! Thanks for coming over and spending the afternoon Heather ... and thank you for the delicious Zucchini Bread! Today I made a card using a new technique (Sunburst) that I found on "Stamp & Scrap with Frenchie". I thought it was such a fantastic technique, but I did change it up from the way Frenchie made her Sunburst. Instead of adding scraps for all the rays, I used a whole piece of plain yellow card stock for the background and then added polka-dot rays with spaces in-between. I also raised the polka-dot rays and the sun for added dimension. This card is for four of the Dare to Get Dirty Challenges that are currently running on Splitcoast Stampers (you need to be a Fan Club member to join in). As I mentioned earlier in the week, there will be 42 challenges in total over the week, ending tomorrow. I know I'm not going to make them all, but I have managed to cover off twelve so far. Hope you like this sunny card!! Your sun is perfect - it makes me smile too. It is very appropriate given our wonderful weather! Well, I'm with the girls above - it made me smile as well. Such a happy card and a great sentiment. Will pop over to catch the video in a minute. Makes me smile, so sunny and bright! Love it. Love this sunny, happy card, Loll! Thanks for the link. I think I'll give this a try! Lovin' this bright and cheery card Loll. I definitely will have to give this a try. Thanks for the lovely inspiration.